Choosing a career is one of the scariest and most important things you will ever do. After all, if you are going to be working 8 hours a day, 5 days a week for the foreseeable future than that is going to work out as, well, a lot of blooming hours. You don’t want to spend all those hours doing something you hate or something that turns your brain to jelly, do you? If you want to find a career that keeps you happy in the long term then look for something that interests you. Duh. Sure, it sounds easy but if we all did this then the world would be a better place, we would all be happy and unicorns would dance happily among the rainbows. Sadly, too many people simply never make the effort to find a career that interests them. Yet, when we were kids we were all far more honest and said we wanted to be vets because we loved animals or fire-fighters because putting out burning stuff is cool. When we grow up many of us seem to decide that we will just fall into whatever career it is easiest to get into. Don’t give up on your dream of doing what really interests you without even trying. No matter what job you take, you are sure to become an expert at it over time. However, what about starting out by looking for a career at which you know you are going to be good at right from the start? This is sure to be good for your self-confidence and means that you will expect to progress in the role quickly. Of course, one thing to bear in mind is that your career will be long, so you don’t want to paint yourself into a corner with something highly specialized that won’t ever give you the chance to grow and learn new skills. An industry or role that has the chance of expanding and creating new opportunities in the future is ideal for giving you the chance to look forward to your future career with anticipation. What do you think are your chances of wandering into a random restaurant, blindly ordering a meal and it being the best thing you ever eat? Ok, so what if you try the same thing in a music store and work out your chances of finding your favourite song? If you look at it in this way then it is clear that you also stand little chance of finding the perfect career through blind luck alone. Instead, you need do some research and try a few different things. You can’t expect to get it right first time so don’t pin all your hopes on the very first career you try. The more careers you find out about the bigger your chance of finding the right one; it is as simple as that. Of course, you already know other people who work in a number of different jobs. Try speaking to friends and relatives about their work, to see whether any of them does something that could be of interest to you. Are they still happy after years of doing the same thing or do they regret getting into their current career? 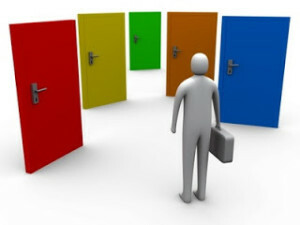 We all have different needs and personalities but you can still get a good idea about different careers in this way. By speaking to a number of people you can start to understand how satisfying certain careers are. These are great tips, some I wish I would have heard when I was starting my college career. I agree with Michelle that if most young people had ponder these points they could have saved some money while attending college. For me getting ready to start a new career, I am determined to do what I love. Life is short and its time to live the life I have always wanted.